I want you to pause for just one moment and consider the possibility of a lifestyle that was fully balanced. I’m talking the right amount of sleep, just enough veggies, and just enough side hustle clients to fulfill your needs. What if I told you there was three ways to balance your full-time life and side hustle? Psh, in your dreams, right? I thought that I had to get my entire life together before I could feel the benefits of my balance within my life. It starts with the small changes. Today we are going to cover three ways you can work towards a balance with your full-time job and side hustle. Embrace your calendar. Make friends with it. Allow it to know your life inside and out and it will bring you a great deal of balance. Even before I started working in my online business, I always had a busy lifestyle. Between school and work, I needed a calendar to keep my life together. I have tried different variations of a calendar system from digital systems to the good old paper pen. With my years of experimentations, I found a mash-up of both to be just what I needed. Currently, I use Google Calendar and Asana to keep me organized. · I lay out my everyday routines and then automatically repeat every day forever for me. · I have all the scheduling of my calls, events, and items that I do not want to forget with digital reminders. · I share this schedule with my OBM to schedule meetings with me. · I have outlined all my projects with day-to-day tasks that I have assigned myself when I first set up the projects. · I can move my business tasks around to where they make sense to make me more productive. For whatever reason, I do things in threes. Three main goals for the day and I have accomplished what I was meant to do. I can be satisfied with it. Why I have no idea. For you, it may be five. No matter what your number is, take a hold of that list of items that you want to accomplish. Do everything in your power to accomplish those items. Make them your focus for the day. Not only does this help with productivity, but helps you not feel the overwhelm from having to spend your last nine hours at your full-time job. Just knowing you can accomplish three items to help you reach your goals, is freeing in a way. You can feel the relief, now don’t you? Another way I implement this is by writing it in my journal every day those three items. I write them the same day or the night before and from there I focus on those three things. You can also write, “I finished” instead of “To-Do” to give a more positive vibe in regards to items you completed. I put this as the last item for us to cover because this is what I struggled with the most. I would do everything but take time for myself. I would then keep wondering why I was still not finding that true balance that I craved. Eating right, making sure to try to go to bed at a decent hour, and balancing my work were all areas that have helped me balance my life. Do not let it fool you. Take time for yourself. Seriously. Learn from my mistake. When I started to schedule time for myself, I found myself to be a lot more relaxed, focused, and determined to get things done. I’m feeling a lot more into my work and also knowing that I am focused on myself first helps me serve my clients better. I started by taking baby steps. Which would range anywhere from watching a movie with my hubby to reading a chapter of a book before going to bed. It was not a commitment of hours, but rather minutes at first. That was then turned into hours as I have formed my business around myself and my health. I even have a disclaimer that my clients agree to when they sign with me stating my hours and that I do put my health first in all situations. I have not had one client disagree with me yet on it. Especially when you are dealing with a full-time life and a side hustle, you have to take time for yourself. Take a bath one night, treat yourself to a coffee, or just get another hour of sleep to help you feel a bit more put together and relaxed throughout your day. It’s a journey and a process. Take it step by step and you will find your balance, I promise! Want help keeping track of your goals in your side hustle? 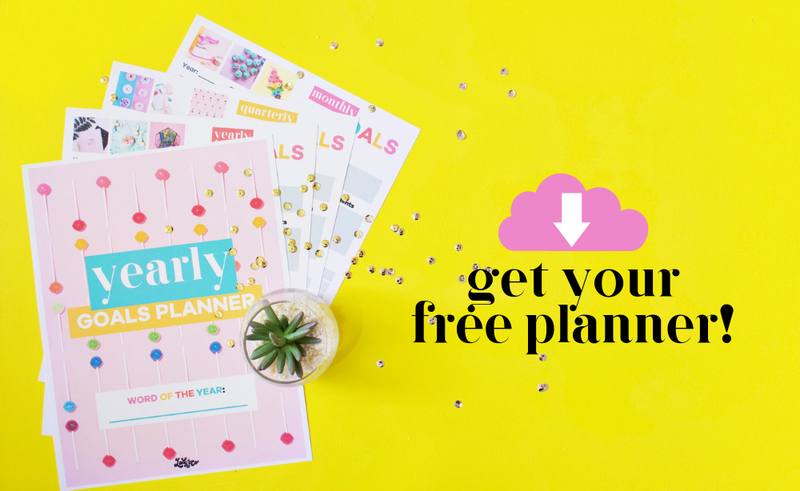 Download the Yearly Goals Planner for added support in your business! Ashley DeLuca is a Digital Marketing consultant who helps creative female entrepreneurs uplevel their web presence, establish authority, and develop their own spot on the internet to call their own with her step-by-step solutions. She has been featured on Think Creative Collective, Brand It Girl Podcast and others. Want to be featured on the LCC blog just like Ashley? Apply Now! Plan out your weekly schedule in Trello just like LCC!